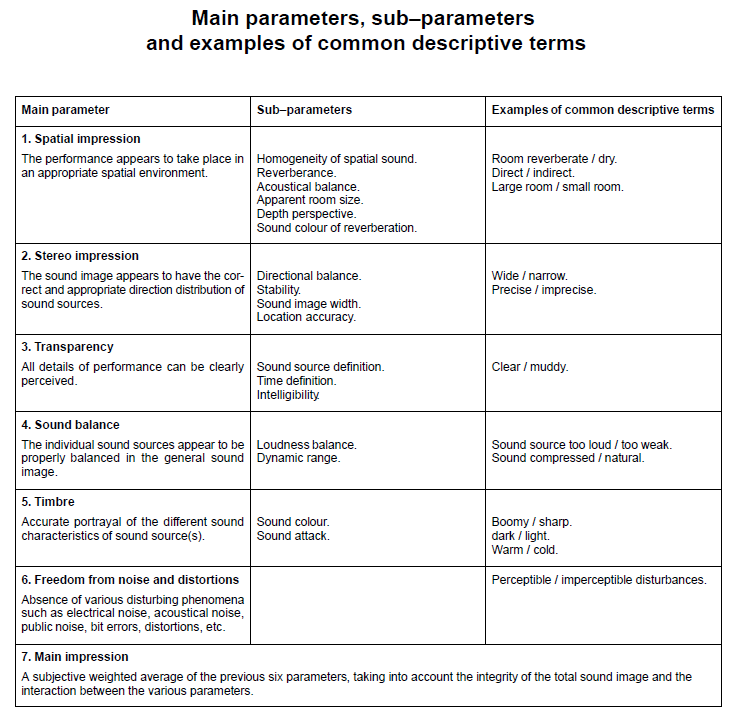 The EBU provides an audio test CD, PEQS, with examples for explaining the above parameters in greater detail. The CD can be downloaded for free in .flac format from the EBU website, and also a user's handbook EBU-TECH 3287 . Only integer values are allowed. on a 7-axis graph. The dark line represents a ranking of 'good' for all parameters. 'Excellent' ranking marks are placed on the outermost circle . 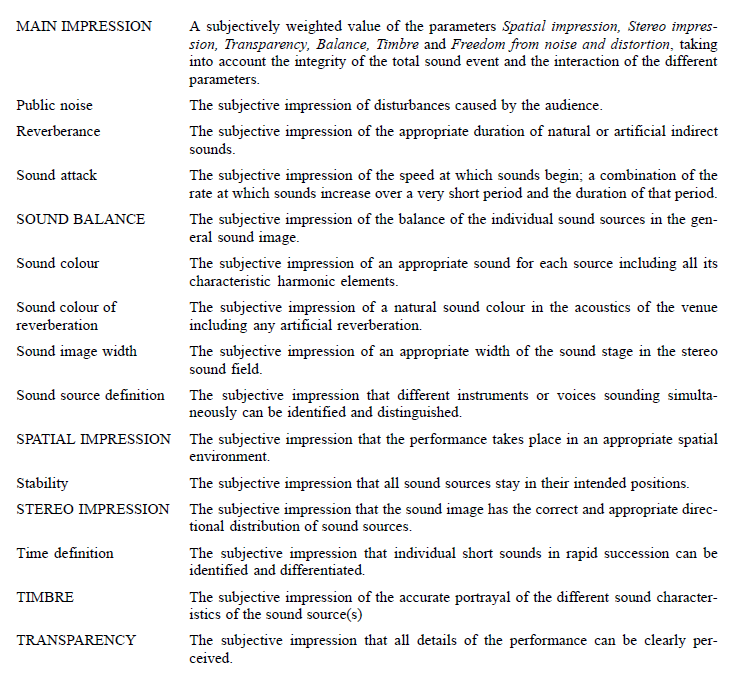 The EBU specifies a range of listening conditions to assure consistent evaluation of recorded material [1, 2]. 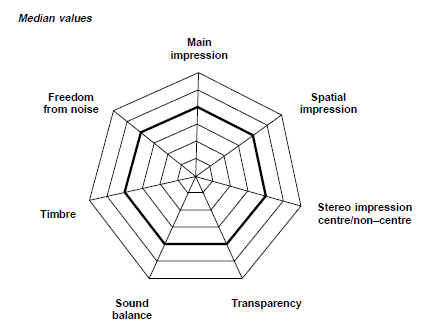 The acoustic properties of the listening room, its size and proportions, placement of loudspeakers and listener, affect the influence of reflections, reverberation and room resonances (modes) upon the subjective impression of the phantom acoustic scene. Most important for critical listening is the ratio of direct loudspeaker sound to room reflected and reverberated sound at the listening position. 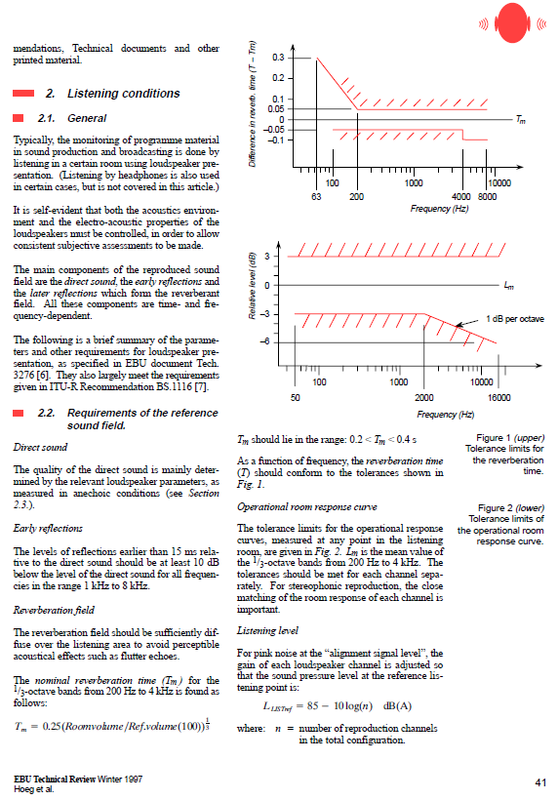 The D/R ratio is frequency dependent, if off-axis radiation from the loudspeaker changes with frequency. 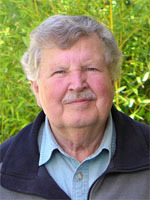 Ideally a loudspeaker has constant directivity so that the reflected and reverberated sound has the same spectral content as the direct sound. 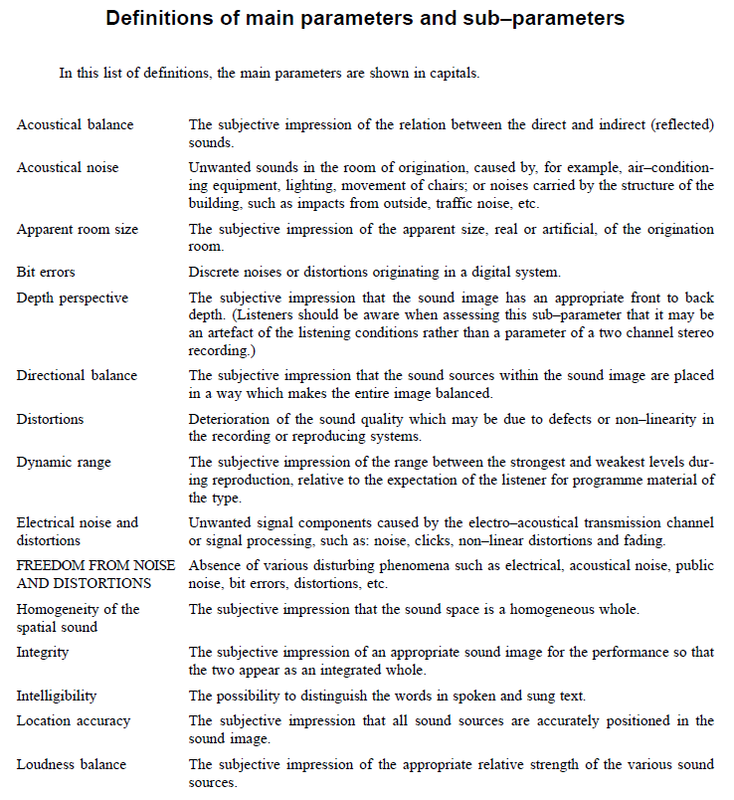 In addition, if early reflections are delayed by more than 6 ms, then the brain can focus attention upon the direct sound streams from the two loudspeakers and withdraw attention from the room sound, which carries redundant information for the creation of the phantom acoustic scene between the loudspeakers. The assumed loudspeaker in Ref. is a typical box loudspeaker, which radiates uniformly into all directions at low frequencies and becomes increasingly forward directional due to baffle and driver size at higher frequencies. It is not a constant directivity loudspeaker. The loudspeaker's behavior determines the room requirements in order to obtain a D/R ratio of better than -6 dB, which is needed for effective monitoring. Thus the 200 Hz to 4 kHz reverberation time Tm must be around 250 ms for a 100 m3 volume, e.g. for a 5 x 8 x 2.5 m room [1, 2]. A considerable amount of room treatment material is required to achieve this low Tm. It is equivalent to 45% of the room's surface area to behave like open windows for letting sound escape. A constant directivity loudspeaker such as the LX521 Monitor will achieve the same D/R ratio in a much more lively room, such as a normal living room. It is difficult to describe an aural scene without a common language and understanding of terms. 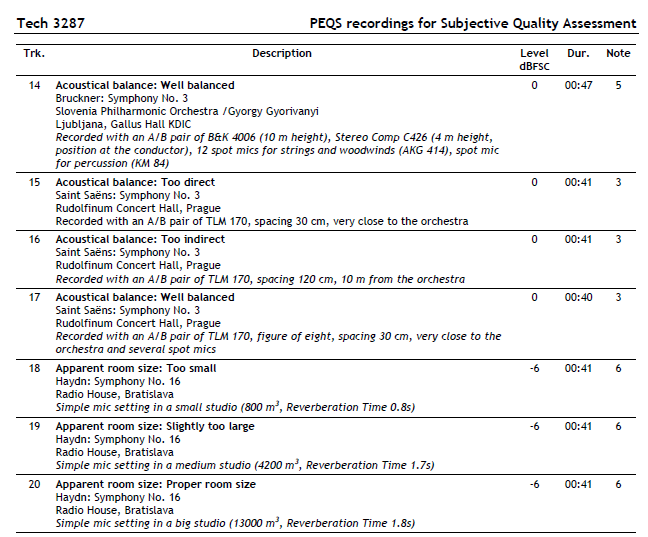 The PEQS CD provides examples for each of the parameters below. Each of the above parameters is explained in alphabetical order below. The user's handbook  for the PEQS CD points out what to listen for in the different tracks and leads to practical learning experiences, which then can be applied to the evaluation of other recordings. A second CD, SQAM, provides short tracks of single instruments, vocal, speech, vocal & orchestra, orchestra and pop music to check the playback equipment . Both CDs can be downloaded for free in .flac format.